vineyard at the top of New Zealand’s South Island. Situated 25 minutes from both Nelson and the stunning Abel Tasman National Park, yet only a five minute drive from Mapua wharf’s waterfront restaurants, cafes and boutique stores. Using sustainable vineyard practices, Ruby Bay Vineyard produce an exclusive range of single vineyard wines; Sauvignon Blanc, Riesling, Pinot Gris, Pinot Noir and Chardonnay. These wines are available through the cellar door, by direct mail order, or various liquor outlets, and can be enjoyed in Nelson’s best restaurants and cafes! 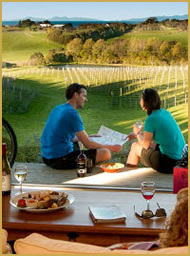 The Lodge and Cottage accommodation enjoys stunning views over the vineyard and Tasman Bay beyond. A high level of personal attention for only 8 guests is experienced in a relaxing, intimate environment. Enjoy an insider’s perspective of Nelson’s vibrant wine region, whilst experiencing the very best in hospitality and gourmet produce. 2008 Ruby Bay Vineyard Lodge & Cottage. All rights reserved.